This past weekend, a severe storm ripped through a large portion of the central USA, including our little section of North West Arkansas. Strong straight-line winds whipped through the area in excess of 80 miles per hour. Turpentine Creek Wildlife Refuge made it through the storm, but not without some damage around the property. 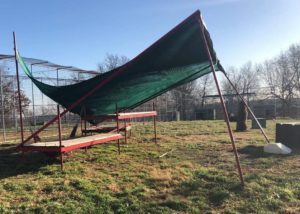 The team at Turpentine Creek came to work Saturday morning to numerous trees down all around the property, including one that fell onto the jump guard of Willy the lion’s habitat causing only a little dent in the fencing. Some of the buildings on property sustained damage, including the roof of our veterinary hospital, two of our safari lodge roofs, and the new bear building. The most prevalent damage was done to our shade cloths and structures. The high winds tore off all the shade cloths at rescue ridge, shredding them beyond use. The winds also bent and twisted some of the recently built metal shade structures in the self-guided discovery area. One was beyond saving in Thunder and Harley’s habitat while the others are just bent and need a little work. Overall, the damage done to Turpentine Creek was minimal. All of our animals came through the storm safely. Luckily, the team was well prepared and made sure all of the animals were secured in their night houses for the evening. Night houses are roofed structures that protect animals from flying and falling debris. They offer safe heavy cement dens for the animals to escape from the weather and feel secure. As a facility that faces storms frequently throughout the year, night houses are vital to protecting our animals. We have also been working over the past year to protect our team and visitors from severe storms as well. 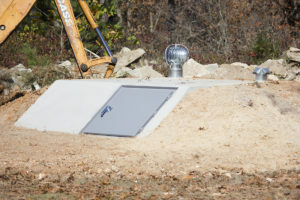 This year we installed multiple storm shelters all over our property. These shelters are FEMA approved and will protect our humans from tornados. Protecting the animals that call the refuge home is essential, but we also have to protect the people who dedicate their lives to caring for the animals as well. Despite the damage, Turpentine Creek is open to the public. Some of our lodging units might not be available as we replace the roofing and our team will be a little busier than usual cleaning up all the trees, but we are still open for visitors. Our insurance will help cover the repairs on the buildings and we have a handy set of team members that can rebuild the damaged shade structures when we have time. Turpentine Creek weathered the most recent storm well. Thank you to everyone who has shown concern over the Refuge this past week. 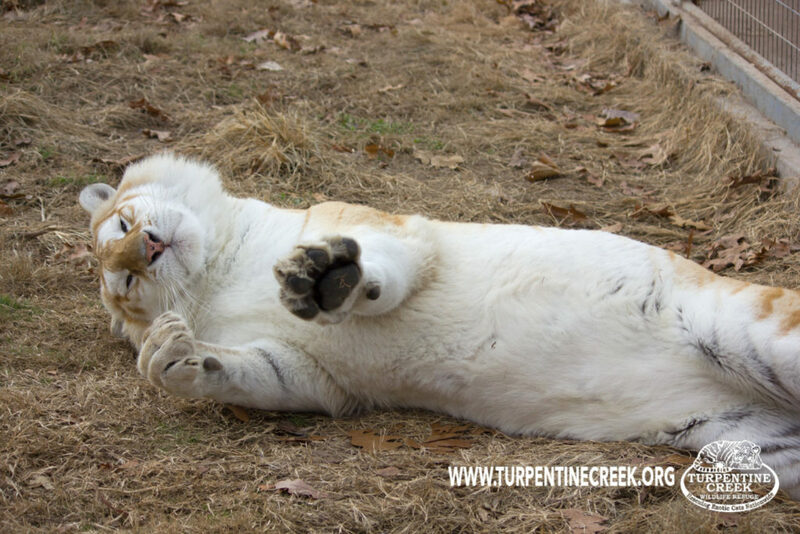 Please donate and help us help them during our slow season this winter. Copyright © 2019 Turpentine Creek Wildlife Refuge. All Rights Reserved. Web Design by Sharp Hue.